All donations are tax deductabile. Who was Peter Klien (Little)? A window to the past. On January 14th, 2007 Barts Centenary United Methodist Church held a Littlestown History Night. There were about 80 people in attendance. At the end of the Power Point Show on Littlestown's history, Ken Thomas asked if there was anyone, who was interested in forming a Littlestown Historical Society. The Following people signed up - Don and Shirley Lindsey, Kenneth S. Bucher, Michael Stoops, Geraldine Spangler, Barbara Steele, Bill Stevens, Paul Staub, Joyce Unger, Ginger Aramacost, and Larry Altoff. Jack Larkin was present on the 14th and stated that he was willing to help in our efforts to form a historical society. He lives in Warren Massachusetts. Jack is Ken's daughter’s father-in-law. He is museum scholar and chief historian at Old Sturbridge Village in Sturbridge, Massachusetts, affiliate professor of history at Clark University in Worcester, Massachusetts. Jack is author of “The Reshaping of Everyday Life 1790-1840", which was a Distinguished Finalist for the P.E.N./Martha Albrand Award for Nonfiction in 1989. He also authored “Where We Lived -Discovering the Places We Called Home - The American Home from 1775 to 1840", which was just released in December. He was present at BCUMC’s Littlestown History night on January 14th. Mr. Larkin said. "If you thought it would be helpful once you have gotten organized, I would be glad to come down to give a talk on the importance of local history." In preparation for the History night, Ken became more and more interested in the history of the Littlestown Area. As he talked to different people there seemed to be a great deal of concern about the history and artifacts that were being lost. There was concern about some of the historic buildings and what was happening to these. 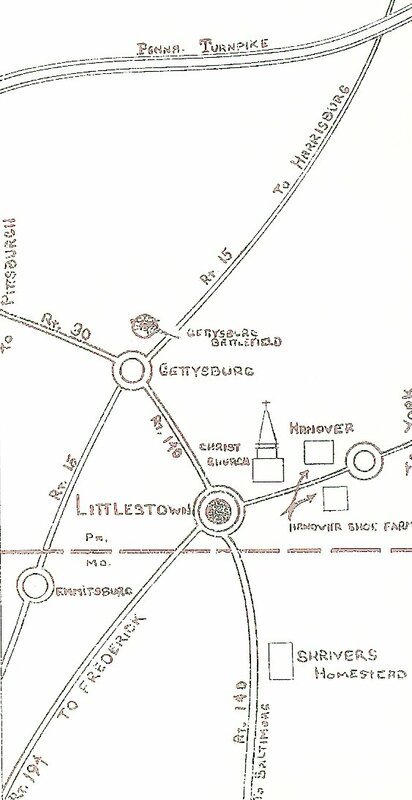 There were a number of people who stated that they wished that Littlestown had a historical society. Ken wondered why someone didn't do something about starting a historical society. He finally decided that he would begin the process if he could get people interested. Shortly after this Ken Developed and posted this Web Site for the purpose of the society. Ken also talked to the Administration Board of Barts Centenary United Methodist Church about the possibility of holding the Historical Society meetings in the church. The Ad Board decided that the society could hold their monthly meeting on the 3rd tuesday of each month in the Overflow Room of the Church. They also gave the society permission to set up their head quarters up in the Upper Room of the Church. There were 15 interested people who were able to attend the first organizational meeting held on February 20th, 2007. Ken read a short section of Harry Shriver's book "From Gettysburg to Washington - I lived with Heroes". This book gives a very clear idea of what life was like in the the Littlestown area in the early 1900's and follows United States History up through 1980's. Everyone heard what has transpired in the work to form the society since the Littlestown History Night on January 14th 2007. 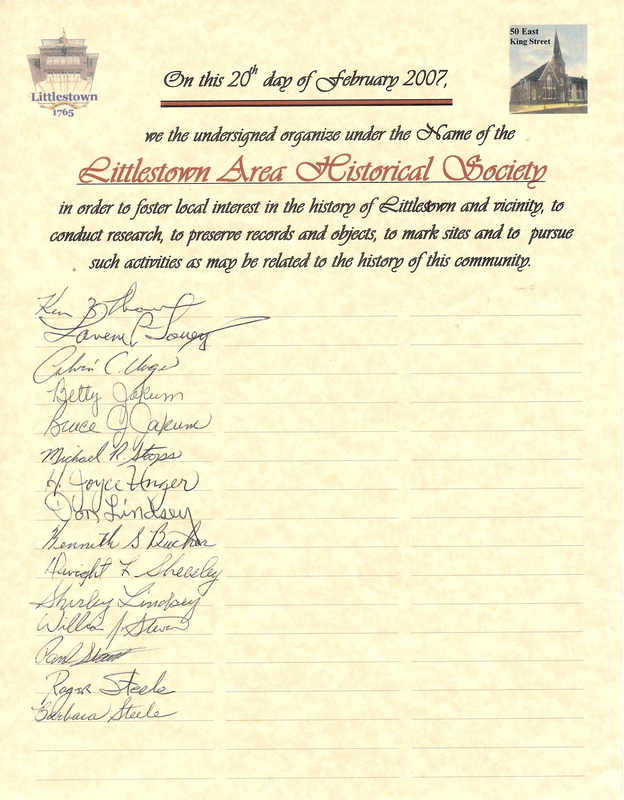 Those present voted to make " Littlestown Area Historical Society" the official name of the organization. They broke into different groups and worked on developing a Constitution, Membership Criteria, a slate of officers, a Mission Statement, and vision Statement, which will be voted on at the next meeting to be held on March 20th at Barts Centenary United Methodist Church. Lavern Louey is looking into getting some of the paperwork that we need in order to be a non-profit organization. Everyone signed a historical organizational document. The program for the next meeting will be given by Bill Stevens, who is the new owner of the Byers-Hess house and is restoring this house into a fine dining establishment for the Littlestown area. Paul Staub, Bill's Son-in-law has helped Bill as they researched this historic house. They will be sharing what they are doing and what they know about the Byers-Hess House. The December meeting will most likely be held at the Byers-Hess House. Those who were present on the 20th were Ken Thomas, Laverne Louey, Alvin and Joyce Unger, Betty and Bruce Jakum, Michael R. Stoops, Don and Shirley Lindsey, Kenneth Bucher, Dwight Sheesley, William Stevens, Paul Staub and Roger and Barbara Steele. * Note - There were a good number of other interested persons who sent messages that they were unable to make this first meeting. Mike Stoops (Our treasurer elect) - "I spoke with Mr. Clayton Wilcox today and he has offered to donate his legal services to help us to incorporate LAHS!" Mike is also working on setting up an Financial Account for the society. Betty Jakum has been in contact with the Hunterstown Historical Society and they have sent us information about the procedures that we should follow in order to establish our society. Inclosed you will find a copy of this information. It looks like we are on the correct path. They just started their Historical society a year ago. On March 6, a number of us met with Attorney Clayton Wilcox to discuss where we are and what we have to do to become incorporated. He offered several suggestions and is looking over our constitution and bylaws in order to offer suggestion on making them incorporate compatible. On March 8th Ken met with Wayne Motts the director of the Adams County Historical Society. This meeting was set up through Jim Witt, who is working on a project at the Adams County Historical Society. Wayne shared much information and made suggestions on what to consider in the establishment of a our society. He answered many questions and suggested ways in which our two historical groups can benefit each other. He was very supportive of the establishment of our society. Thank you, Wayne. The meeting began by thanking the following people. Attorney Clayton Wilcox was thanked for his legal work in helping us become Incorporated. The Littlestown Rotary was thanked for their donation of $500 to the Littlestown Historical Society to help with start up cost. Shirley Lindsey was thanked for transcribing tapes of Bob Spangler's interview. Barry Warehime was thanked for giving us the following DVD's - Littlestown Movie in 41 - 1960 fireman’s 75th anniversary parade - Littlestown 1990 - and - Weikert’s Bakery tour. The Adams County Historical Society and Wayne Motts were thanked for providing suggestions and support for our Societies establishment. Betty Jakumb was thanked for setting up the news releases. Mike Stoops was thanked for setting up our account and working on 501 information. Kristen Milton was thanked for being present as a reporter for the Hanover Evening Sun. The program for the evening was presentation by by Bill Stevens and Paul Staub on the Byers-Hess House. Bill is the new owner of the Byers-Hess house and is restoring this house into Washington's Restaurant a fine dining establishment for the Littlestown area high lighting the murals in the entrance hall of this historic house. Paul, Bill's Son-in-law has helped Bill as they researched this historic house. The December meeting will most likely be held at the Byers-Hess House. Business conducted at this meeting, included, the election of officers and Board of Directors, Establishing the membership criteria and dues, and approving the Mission and Vision Statements of the Society. Memberships were accepted, with 15 members paying their required dues. On April 17th the meeting began with a short business meeting. The By-Laws were approved by the membership and the Nominations Committee was established. The Nominations committee members elected are Joyce Unger, Betty Jakum and Bill Stevens. After the business meeting, retired Littlestown Police Chief Roger Gouker present a program on the history of the Littlestown Police Department. There were about 30 people present. After his presentation, Roger presented the Society with a book that contains the Ordinances and History of the Borough from 1864 until 1965. The program for the May meeting was a slide show by Laverne Louey on many of the buildings of Littlestown form the early years and how some of these look today. There were about 24 people present for this program. At the end of the program Don Snyder presented to the Society a 125th aniversity metal coaster. Thank you Don. There were a number of people present who are planning to join the society and several told of items that they paln to donate to the society. The June 19th meeting was a coordinated effort between Barts Centenary United Methodist Church and The Littlestown Area Historical Society. The program was a reshowing of the Littlestown History PowerPoint CD that the church has produced. The CD has been updated with more facts and designed so that viewers do not have to read so much of the information. This part of the program took place in the sancutary of the church. After the show there were tables in the social hall with items that people brought along to show and tell about, items connected with the Littlestown Area History. The July meeting was held at Mud College (Pleasant Grove) School. Ellie Bennet gave everyone a tour of the school and explained its history and the transition of ownership from the time that it was owned by Mount Joy Township until it is once again owned by the township as a historic site. There were about thirty (30) people present for the experience. The August Program was on the Edge Hill Academy of Littlestown - Ken Sell was the presenter. There were about 45 in attendance. Willis and Virginia Myers were present. They are the Present owners of this building. Dr. Sell used a PowerPoint show as he told about the school and the some of the students wha attended this school. Many people who were present knew many of the people who attented the Edge Hill Institute, but did not realize that these people had attended the edge Hill Institute. The September meeting was on the history of the Littlestown Foundry. Mr. L. Robert Synder gave the presentation which included video and showed the many changes that have taken place since the foundry was estaablished in 1916. There were about 45 people present for the program. October 16th meeting was an overview of Church history in the Littlestown area with a more detailed history of the Methodist Church in Littlestown.Ken Thomas prepared and presented this program. There were about 30 in attendance. November 20th meeting was on the life of Herb sell There were about 40 or so in attendance. Herb talked and played the piano for about two hours. It was an evening of education, humor and entertaiment. The December 18th meeting was held at the Byers-Hess House. There were about 60 who attended as well as members of the Hess Family. The group was broken into three groups and one group at a time was taken on a tour of the house by Paul Staub, Son-law of Bill Stevens the owner. He explained what they are doing and how the house will be the Washington Restaurant. The other two groups waited in the large front rooms of the house where they were treated to refreshments furnished by Bill Stevens, his wife and his daughter. The January 15th meeting was held at Methodist Hall. There were 40 people present. The latest Version of the Littlestown PowerPoint on CD was shown. An election was also held adding Marilyn Zanger to the 2008 class and adding Scott Zanger to the 2009 class. Once again there seems to be much excitement about the society. Clifton Bittle is interested in presenting a program on The Bittle family history. Larry Althoff is interested in presenting a program on the Littlestown Railroad and also possibly one on the Littlestown Trolley. We also received foru new members at this meeting. The February 19th meeting was held in the Methodist Church. There were about 80 people present. We were presented the Littlestown quilt created to celebrate our countries bicentennial in 1976 by the Grant Stavely family. Ivan Lufriu presented the his program on the history of the Shriver family and the comlex at Union Mills (The Shriver Homestead). We weceived two new members to bring our total to 101. The March 19th meeting was held in the Methodist Hall. There were about 35 people present. Mr. Jack Larkin was the keynote speaker. He talked about the need to preserve our history. Mr. Larkin is the chief historian at Sturbridge Village in Sturbridge, Massachusetts. Mr. Larkin is also an affiliate professor of history at Clark University in Worcester. He has been commissioned to write a number of books about the history of our nation. The April 15th meeting was held in the Methodist Hall. There were about 62 people present. Mr. Bruce Jakum was the keynote speaker on the subject of Kentucky rifle makers of the Littlestown Area, with an emphasis on the Sell family. Mr. Jakum had a sample of a rifle, powder horns and a bullet tool form the Kentucky rifle era. The May 20th meeting was held in the Methodist Hall. There were about 30 people present. Mr. Ken Bucher was the keynote speaker on the subject of his life in Littlestown area and his struggle with not being able to read. He had pictures and items documenting his success at learning to read and his interaction with former first lady Barbara Bush. The June 17th meeting was held in the Methodist Hall. There were 30 people present. Ken Thomas presented a short PowerPoint show on the History of Littlestown. During the second part of the program Jack Ketterman showed a Littlestown Foundry casting of a book end that he bought at auction. He did not reveal what he had to pay for it, but he said that it is the most valuable piece in his Littlestown collection. Anna Weaver brought a long many pictures and gave them to the historical society. Mr. Brown brought along several items to display and talk about. One of the most interesting item was a large sale bill for a auction many years ago. On this was the information about terms for paying for items. Any total that was $5.00 or less had to be paid in cask. Any total more that $5.00 could be paid for over a period of time.